The berries and the roots are used from this invaluable plant. This medicine is widely used by indigenous folks from all over the Pacific Northwest Coast. It can help with infections in the body, as well as urinary tract infections and blood disorders and infections. The grapes can be picked when they look like smaller versions of concord grapes. They are very bitter to eat fresh, but they make a fantastic grape jelly! try it with natural sweeteners like honey or blend some licorice roots for extra medicinal sweetness, and try making it with your own version of natural pectin or Pamona’s Natural Pectin. 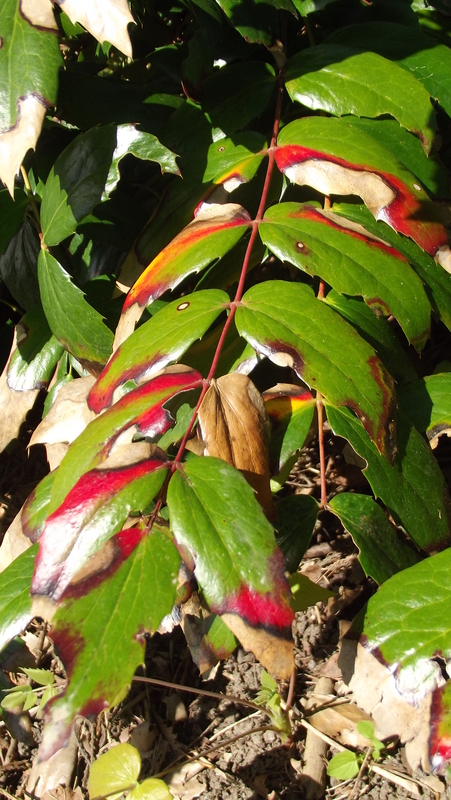 The leaves go from a range of green, to yellow hues and red as well. The roots are bright almost neon yellow. The berries are deep purple with dusty purple skins. This is also a bee friendly plant. Looks more like Mahonia nervosa (Cascades Mahonia) than Mahonia aquifolium (Oregon Grape). The difference is in the leaf edge – aquifolium is wavy and nervosa is flat. i took this off a wiki site… the two plants are very similar, and do exactly the same thing, the only difference is that one is grows very large and the other doesn’t.